Manatees are the only vegetarian marine mammals. Gentle and playful marine mammals, Florida manatees have come to represent the amazing biodiversity of the Everglades. With their large size, slow-moving nature, and fondness for munching sea grass, it's easy to see why they're nicknamed “sea cows.” Found in Florida's coastal waters, manatees will also migrate into estuaries and shallow rivers, following the warm temperatures they need to survive. They have long been a source of fascination for those who encounter them, most notably inspiring sailors' tales of mermaids — even Christopher Columbus remarked upon these less-than-gorgeous “mermaids” while on his New World travels. But despite their enduring popularity, today manatees are more imperiled than ever. Originally listed as endangered under the Endangered Species Act in 1973, manatee numbers have never truly recovered, as the animals must contend with a barrage of manmade threats. Each year, about 87 manatees are killed by collisions with boats, the single greatest cause of premature mortalities. This is more than seven times number of manatees that the Fish and Wildlife Service estimates can be killed without impairing the species' recovery. Meanwhile, boating in Florida is at an all-time high and increasing with more boats in the water and boating infrastructure threatening manatees. In 2014, the Center released a report finding that the government's fast-track authorization of watercraft-access projects without analyzing their collective impacts is likely a key factor in enabling the boat collisions that continue to be the leading killer of manatees, resulting in an average of 82 manatees every year. Climate change also poses a threat: Cold snaps caused by unusual fluctuations in sea temperatures are killing a large number of manatees, while higher surface-water temperatures produce more severe hurricanes and lethal red-tide algal blooms. These threats, combined with loss of habitat and food sources due to urban development, add up to bleak prospects for the manatee's future. Thanks to a scientific petition by the Center, in 2009 the U.S. Fish and Wildlife Service announced that a three-decade-old critical habitat designation — badly in need of an update — might warrant review. But early the next year, the Service announced it would indefinitely postpone actually granting the manatee a new designation. And in 2017, the Service downlisted the manatee from “endangered” to “threatened” despite the fact that 2016 had been the deadliest-ever year for manatees. 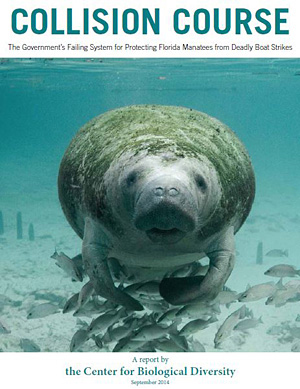 Collisions with watercraft are a persistent and often deadly threat to endangered Florida manatees — yet our report shows the feds haven't truly been protecting them.